We highlighted previously that April tends to be the most bullish month for WTI and, having gained 7.3% this month already, is on track to retain its trend. The daily trend structure remains firmly bullish with minor pullbacks and timely cycles. Furthermore, the 8, 21 and 50 eMA’s are fanning and prices are bobbing along the 8-eMA to underscore the strength of the overall trend. Prices have found resistance around the August lows, although yesterday’s bullish engulfing candle suggests WTI may try to break to new cycle highs. A break above $65 would confirm a bull-flag on the daily chart and assume a run towards the $67.88 high. If it holds above $63 and breaks higher, it’s another testament to the trend’s strength, but it wouldn’t be the end of the world if we saw a deeper retracement towards the $61.80 area first. Either way, we’re watching closely for a break above $65 to bring the $67.88 high into focus. City Index: Spread Betting, CFD and Forex Trading on 12,000+ global markets including Indices, Shares, Forex and Bitcoin.Click here to find out more..
CLICK HERE TO REGISTER FOR FREE ON ADVFN, the world's leading stocks and shares information website, provides the private investor with all the latest high-tech trading tools and includes live price data streaming, stock quotes and the option to access 'Level 2' data on all of the world's key exchanges (LSE, NYSE, NASDAQ, Euronext etc). This area of the ADVFN.com site is for independent financial commentary. These blogs are provided by independent authors via a common carrier platform and do not represent the opinions of ADVFN Plc. ADVFN Plc does not monitor, approve, endorse or exert editorial control over these articles and does not therefore accept responsibility for or make any warranties in connection with or recommend that you or any third party rely on such information. The information available at ADVFN.com is for your general information and use and is not intended to address your particular requirements. In particular, the information does not constitute any form of advice or recommendation by ADVFN.COM and is not intended to be relied upon by users in making (or refraining from making) any investment decisions. Authors may or may not have positions in stocks that they are discussing but it should be considered very likely that their opinions are aligned with their trading and that they hold positions in companies, forex, commodities and other instruments they discuss. 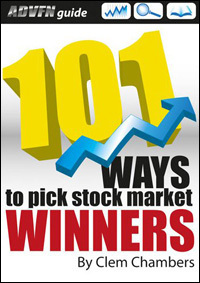 ADVFN covers all things stock market. If you trade or invest ADVFN has the tools you need to make the right decisions. You need the number one bestselling investment guide, the definitive text for day traders, investors and stock pickers. 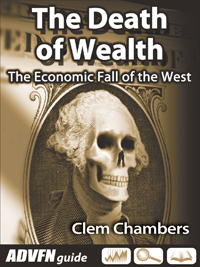 Dissecting the global economy and the financial markets, the book lays out the evidence for the next economic game changer: the Death of Wealth.